I recently asked for and received from Seagate (See recent post about them moving their paper head quarters to Ireland here) a Momentus XT 500GB 7200 RPM 2.5 Hybrid Hard Disk Drive (HHDD) to use in an upcoming project. That project is not to test a bunch of different Hard Disk Drives (HDDs), HHDDs, Removable HDD (RHDDs) or Solid State Devices (read more about SSDs here and here or storage optimization here) in order to produce results for someone for a fee or some other consideration. Do not worry, I am not jumping on the bandwagon of calling my office collection of computers, storage, networks and software the StorageIO Independent hands on test lab. Instead, my objective is to actually use the Momentus XT in conjunction with other storage I/O devices ranging from notebook or laptop, desktop or server, NAS and cloud based storage in conjunction with regular projects that Im working on both in the office as well as while traveling to various out and about activities. More often than not these days, common thinking or perception is that if anybody is talking about a product or technology it must be a paid for activity as why would anyone write or talk about something without getting or expecting something in exchange (granted there are some exceptions). Given this era of transparency talk, lets walk the talk and here is my disclosure which for those who have read my content before hopefully you will realize that disclosures should be simple, straight forward, easy, fun and common sense based instead of having to dance around or hide what may be being done. This is not a paid for or sponsored blog (read my disclosure statement here) and in fact is no way connected to in conjunction with, endorsed, sanctioned or approved by Seagate for that matter nor have they been and currently are not a client. I did however ask them for and they offered to send to me a single 500GB Momentus XT Hybrid Hard Disk Drive (HHDD) with no enclosure, accessories, adapter, cables, software or other packaging to be used for a project I am working on. However I did buy from Amazon.com a Seagate GoFlex USB 3.0 to SATA 3 connection cable kit that I had been eyeing for some other projects. Nuff said about that. As to the project I am working on, it has nothing to do with Seagate or any other vendors or clients for that matter as it is a new book that I will tell you more about in future posts. What I can share with you for now is that it is a follow on to my most previous books ( The Green and Virtual Data Center (CRC) and Resilient Storage Networks (Elsevier) ). The new book will also be published by CRC Taylor and Francis. Now for those who are interested in why would I request a Momentus XT Hybrid Hard Disk Drive (HHDD) from Seagate while turning down others offers of free hardware, software, services, trips and the like it is many fold. First I already own some Momentus (as perhaps you do and may not realize it) HDDs thus thought it would be fun and relatively straight forward to make some general comparisons. I needed some additional storage and I/O improvements to compliment and coexist with what I already have. Does this mean that the book is going to be about flash Solid State Devices (SSD) since I am using a Momentus XT HHDD? The short answer is NO, it will be much more broadly focused however certainly various types of storage I/O control, public and private clouds, management, gaining control, networking, virtualization as well as other hardware, software, services techniques and technologies will be discussed building on my two previous books. In addition, I want to see how compatible and useful in every day activities the HHDDs are as opposed to running a couple of standard iometer or other so called lab bench tests. After all, when you buy storage or any IT solutions, do you buy them to be used in your lab to run tests, or, do you buy them to do actual day to day tasks? I also have been a fan of the HHDD as well as flash and DRAM based SSDs for many years (make that decades for SSDs) and see the opportunity to increase how I am actually using HDDs, HHDDs, SSDs as well as Removable Hard Disk Drives (RHDD) in conjunction with NAS, DAS and other storage to support my book writing as well as other projects that I have bought in the past. The Seagate Momentus series of HDDs are positioned as desktop, notebook and laptop devices that vary in rotational speed (RPM), physical form factor, storage capacity as well as price. The XT is a Hybrid Hard Disk Drive (HHDD) that is essentially a best of breed (hence Hybrid) type device incorporating the high capacity and low cost of a traditional 2.5 7200 RPM HDD with performance boost of flash SSD memory. For example some initial testing of working with very large files have found that the XT can in some instances be as fast as a SSD while holding 10x the capacity with a favorable price. In other words, an effective balance of cost per GByte capacity, cost per IOP and energy efficiency per IOP. This does not mean however that an XT should be used everywhere or for a replacement to DRAM or flash SSD quite to the contrary as those devices are good tools for specific needs or applications. Instead, the XT provides a good balance of performance and capacity to bridge the gap between traditional spinning HDDs price per capacity and performance per cost of SSD. (For those interested, here is a link to what Seagate is doing with SSD e.g. Pulsar in addition to HHDD and HDD). What is the benefit, why not just go all flash? Simple and that is price unless your specific needs fit into the capacity space of an SSD and you need both the higher performance and lower energy draw (with subsequent heat generation). Note that I did not say heat elimination as during a recent quick test of copying 6GB of data to a flash based SSD it was warm just as the XT device was, however also a bit cooler than a comparable 7200 RPM 2.5 drive. If you can afford the full SSD flash or dram based device as well as it fits your needs and compatibility, go for it. However also make sure that you will see the full expected benefit of adding a SSD to your specific solutions as not all implementations are the same (e.g. do your homework). Why not just go all HDD? Simple, economics and performance which is why as I said back in 2005 that HHDDs had a very bright future and will IMHO drive a wedge between the traditional HDD and emerging flash based SSD markets at least for non consumer devices on a near term basis given their compatibility capabilities. In other words, you could think of it as a compromise, or as a best of breed. For example I can see where for compatible not to mention cost and customer comfort ability of a known entity HHDD will gain some popularity in desktops, laptops, notebooks as well as other devices where a performance boost is needed however not at the expense of throwing out capacity or tight economic budgets. I can also see some interesting scenarios for hosting virtual machines (VMs) to support server Virtualization with VMware, HyperV or Xen based solutions among others. Another scenario is for bulk storage or archive and backup solutions where the HHDD with their extended cache in the form of flash can help to boost performance of read or write operations on VTLs and dedupe devices, archive platforms, backup or other similar functions. Sure the Momentus XT is positioned as a desktop, notebook type device however has that ever stopped vendors or solution providers from using those types of devices in different roles other than what they were designed for? I am just sayin. 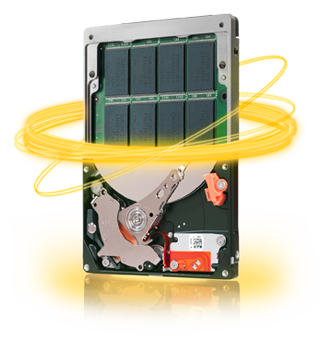 Seagate has many different types of disk drives that can be found here. In general, the Momentus XT is a 2.5 small form factor (SFF) Hybrid Hard Disk Drive (HHDD) available in 500GB, 320GB and 250GB capacity (I have the 500GB model ST95005620AS) with 4GB SLC NAND (flash) SSD memory, 32MB of drive level cache, an underlying 7200RPM disk drive with SATA 3Gb/s interface including as well as Native Command Queuing (NCQ). Now if you want to say that the XT implements tiered storage in a single device (DRAM, flash and HDD) go ahead. Following are a couple of links of where you can learn more. What does a Momentus XT have to do with writing a book? If you have ever written a book, or for that matter, done a large development project of any type then things should be a bit familiar. These types of projects include the needs to keep organized as well as protected multiple copies of documents (a dedupers dream) including text, graphics or figures, spreadsheets not to mention project tracking material among others. Likewise as is the case with other authors who work for a living, much of these books are written, edited, proofed or thought about while traveling to different vents, client sites, conferences, meetings or on vacation for that matter. Hence the need to have multiple copies of data on different devices to help guard against when something happens (note that I did not say if). This is nothing new as each of my last two solo book projects as well as when I was a coauthor contributing content to other books including The Resilient Enterprise (Veritas/Symantec). Much of the content was created while traveling relying on portable storage and backup while on the road. Something someone pointed out to me recently is that this is an example of eating your own dog food or eliminating the shoe makers children syndrome (where the shoe maker creates shoes for others however not for his own children). From time to time I will post some notes and observations about how the Momentus XT is performing or behaving which if all goes as planned and so far has, it should be very transparent coexisting with some of my Removable Hard Disk Drives (RHDD) such as the Imation Odyssey which I bought several years ago for offsite bulk removable storage of data that goes to a secure vault somewhere. Initial deployment other than a stupid mistake on my part has been smooth. What was the stupid mistake you ask? Simple, when I attached the drive via a USB 3.0 cable to SATA 3 connector to one of my XP SP3 systems, Windows saw the device however it did not show up in the list of available devices. Ok, I know I know, it was late in the evening however that is no excuse for realizing that the disk had not yet been initialized let alone formatted. A quick check using Seatools (free here) showed all was well. I then launched Windows Disk Manager, did the initialize, followed by format and all was good from that point on. Wow, wonder how much credibility I will lose over that gaff with the techno elite (that is a joke and a bit of humor btw). I have already done some initial familiarization and compatibility testing with some of my other drives including a 2.5 64GB SATA flash SSD as well as a 2.5 7200RPM HDD both that I use for bulk data movement activities. At some point I also plan on attaching the XT to my Iomega IX4 NAS to try various things as I have done with other external devices in the past. Granted these were not ideal conditions as I was in hurry and wanted to get some quick info. Given the probably less than ideal configuration as the format after the HDD was first initialized took about an hour using a FAT32 plug and play configuration. With NTFS and other optimizations I assume it can be better however this was again just to get an initial glimpse of the device in use. Given that it is a HHDD that uses flash as a big buffer with a 500GB HDD plus 32MB of cache as a backing store, it was interesting attaching it to the computer, then waiting a few minutes, then launching a file copy. Where a normal HDD would start slightly vibrating due to rotation, it was a few moments before any vibration or noise was detected on the Momentus XT which should be of no surprise as the flash was doing its job acting as a buffer until the HDD spun up for work. I did some initial file copying back and forth between different computers while LAN and NAS were busy doing other things including backups to the Mozy cloud. No discrete time or performance benchmarks to talk about yet, however overall, the XT not surprisingly does seem to be a bit faster than another external 7200 RPM 2.5 drive I use for bulk data moves both on reads and writes. Likewise, given that it is a hybrid HDD leveraging flash as an extended cache with an underlying HDD plus 32MB of cache, it may not always be as fast as my external 2.5 64GB flash SSD, however that is also a common apples to oranges comparison mistake (more on that in a future post). For example, copying over 6GBytes of data (5 large files of various size) from a 7200 RPM 2.5 160GB Momentus drive in a laptop to the HHDD XT and a flash SSD both took about 8 to 9 minutes where as the normal copy to a 2.5 5400 RPM HDD takes at least 14 to 15 minutes if not longer. Note that these are very rough and far from accurate or reflective comparisons rather a quick gauge of benefits (e.g. getting data moved faster). When I get around to it, will do some more accurate comparisons and put into a follow up post. However I can see already where the XT has the performance similar to the SSD however with almost 10x the capacity which means it could possibly have an interesting role in supporting disk to disk (D2D) backups which I will give a try. Eventually I will be removing the USB connector kit and actually installing the Momentus into a computer or two (not at the same time) however I am currently walking before running. Im still up in the air as to if I would install the XT into a computer with Windows XP SP3, or simply do a new install of Windows 7 on it to which Im open to thoughts, comments, feedback or applicable suggestions (besides switching to a Macbook or iPad). In the above photo, there is the Seagate Momentus (ST95005620AS), a Goflex USB 3.0 to SATA conversion attachment cable (docking device), a fortune cookie, couple of US quarters and Canadian two dollar coins (See out and about update), paper clips and fishing bobber on a note pad. Why the coins to show relative size and diversity across different geographies as this device will be traveling (it missed out on recent European trip to Holland). Why the paper clips? Simple, why not, you never know when you will need one for something such as a MacGyver moment, or for pushing the tiny reset button on a device among other activities. How about the fortune cookie? For good luck and I might need a quick snack while having a cup of coffee not to mention Chinese as well as Asian in general is one of my favorites cuisines to prepare or cook not to mention eat. Oh, what about the fishing bobber? Why not, it was just laying around and you could also that Im fishing for information to see how the device fits into normal use or that it is there for fun or to add color to the photo. Oh, and the note pad? Hmm, well, if you cannot figure that one out besides being a back drop, lets just say that the Momentus line in general as well as XT specifically are targeted for notebook, desktop, laptop or other deployment scenarios. If you still dont see the connection, ok fine, feel free to post a comment and I will happily clarify it for you. That is all for the moment, however I will be following up with more soon. In the meantime, enjoy your summer if in the northern hemisphere (or winter if in the south). Take lots of photos, videos and make audio recordings to fill up those USB flash thumb drives (consumer SSD), SD memory cards, computer hard drives, cloud and online web hosting sites so that have you something to remember your special out and about moments by.